Last week I had my first experience in a Turkish hamam, better known as a Turkish bath house. It’s interesting that I generally only seem to have these experiences in foreign lands: German spa in Baden Baden, a spa on the outskirts of Mexico city, or Korean Spa in Los Angeles, . I brought a bikini as I read in my guidebook that these were optional. I informed this to the staff attendant as she led me to my personal changing room, she looked in my bag at the bikini, and then looked back up at me. “Relax,” she said with a smile in her broken English. Relax, sure. I will do as the Turks do, going naked into the hamam. At least all staff and customers were females on this side. I slipped over the red and white towel they had given me and put on the wooden platform sandals, as I waddled into the hamam, not wanting to fall on the floor. 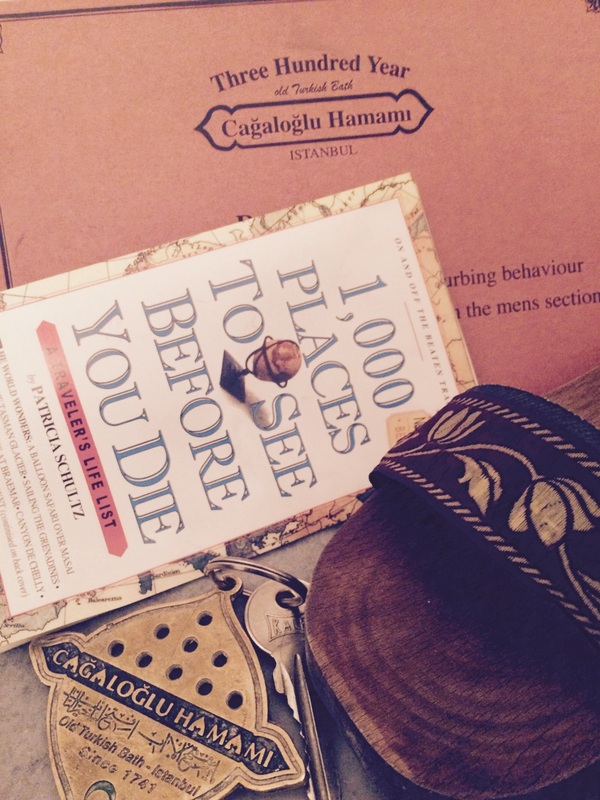 My senses were in heaven, as I entered the room Cagaloglu Hamami, built over 300 years ago. The room had one massive dome, with patterns of Arabic stars and astronomical shapes that surrounded it. I followed the routine the regulars seemed to do. Walk over to a basin that’s filled with a pail of warm water and pour it over myself and my towel. The next step is to walk to the circular massive marble flat, lay your towel on it, and naked body above. Your job is to simply “relax”. Feel your pores begin to open slowly, and gaze at the dome, or take a nap. Some people choose to do a self treatment, as I am sure the cost can be exorbitant if you come to the hamam once a week, as recommended by the Turks. If you chose to purchase treatment, an attendant would awaken you when your turn arrived. I opted for their exfoliation and massage treatment. I waited for thirty minutes, but no attendant came. I reminded a staff member of my service when she entered the room. I must have been the only one who was not used to relaxing in steamy marble room for this amount of time. Patience, I reminded myself. Eventually my attendee arrived in the hamam. She was a fifty something woman, who first came into the room and did a self service. Initially she bathed herself with a pail of warm water in her towel, then proceeded to put on her bathing suit. After she ensured that her body and mind had adjusted to the soothing environment, she could care for me. She walked towards me with a smile, broken English, I can’t recall her name. She then escorted me carefully to the basin to pour warm water over me gently. As I laid back on my towel over the hamam, she began to exfoliate my entire body prior to bathing, and then massaging me. In American society, the only times you generally receive this kind of detailed treatment is when you are either a child getting bathed by your mother, or a geriatric in a nursing home. Somewhere in between we forget how special it feels for someone to take care of us. There’s quite wonder that occurs not just when someone massages our backs, but cleans behind our ears, or lathers the shampoo on our scalps. The irony is the person who is doing this treatment to me is a stranger, in which we do not speak the same language. This is her job, body after body, she cares for in the same manner. She offers each a sense of detailed special attention, and for a moment the recipient feels like royalty. Although all of us has different types of roles and jobs in our lives, can you offer that detailed attention and awareness perhaps to the customer or product that’s in front of you? For a moment imagine you are serving royalty. It’ll come back to you. 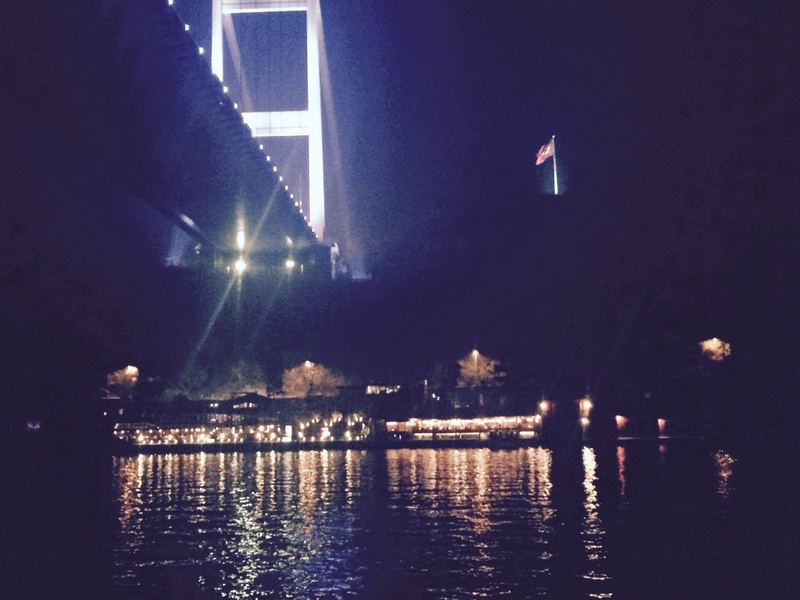 The dinner cruise ship starts to sail along the Bosphorus River, which separates European Istanbul from Asian Istanbul. Immediately I wonder if this was a good decision. Rarely do I feel awkward drinking and eating alone in public, but this occasion was different. An American flag sat in front of my dinner plate, denoting to the rest of the cruise ship attendees that I was American…the only American. Sadly I could not determine the majority of the other flags in the room, but all the other patrons were at least in a party of two. This was a boat of celebrations I learned: three birthdays and one 40 year wedding anniversary. I wasn’t really celebrating, but attempting to squeeze in as much of the Turkish culture I could on my short three day weekend. As I cut into my main course of chicken next to cooked vegetables and goat cheese, I tried to see how I extend this meal for as long as possible. If I was engaged in an activity, maybe it would not be awkward. Nobody sat directly around me. The seats were pre-arranged, and although I was near the performance center stage, I was not really close to anybody else. Some Palestinians sat at my table further down, but it did not appear anyone wanted to acknowledge my presence. Maybe I should have said I was from Canada. The host for the evening was an elderly Turkish man, who greeted each table and their flag as if we were representatives from the United Nations. After he introduced each country into the microphone, applause was expected. We saw representatives from Turkey, Morocco, United Arab Emirates, Israel, Spain, Austria, and Lebanon. When it came to my table, the host called me “the big boss: CNN.” I somewhat knew what he was insinuating. Earlier that day, an expat friend Missy informed me of a fiasco that occurred on CNN recently, in which an educated religious scholar discussed the stereotypes of Islam that Americans had. None of his points were realized as the interview progressed, further exemplifying the lack of world awareness Americans have. And now this Turkish host was introducing me as CNN. I was aware of the negative comment he was making towards me, which was covered in the disguise of a compliment. I simply smiled in response. When he was done introducing America, minimal applause occurred. These people hated me and what I represented. Could I blame them? The irony was it was Martin Luther King Jr. weekend, a reminder of a man who fought for justice in America. He gave his life for this cause of equality, and represented freedom for so many African Americans. Outwardly I didn’t look American. I am of Filipino, Spanish, Polish, and Czechoslovakian descent. During the days of MLK, my parents’ union would have been illegal, and now I was free. While my fellow countrymen rejoiced in the states this weekend, I was feeling discriminated against because of the country I was born into. These people did not know me as an individual, simply their stereotypes of where I came from. 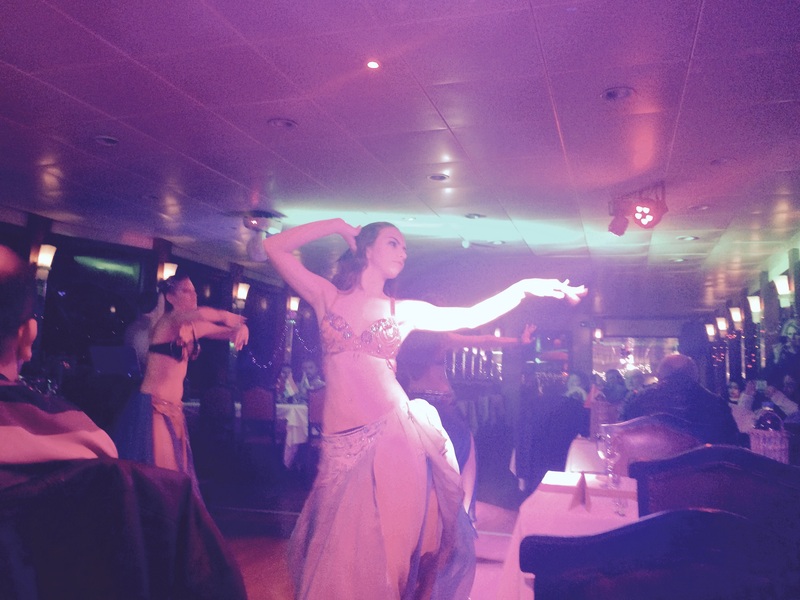 As the night continued, the Twirling Dervish dance and belly dancers became the focus of attention. 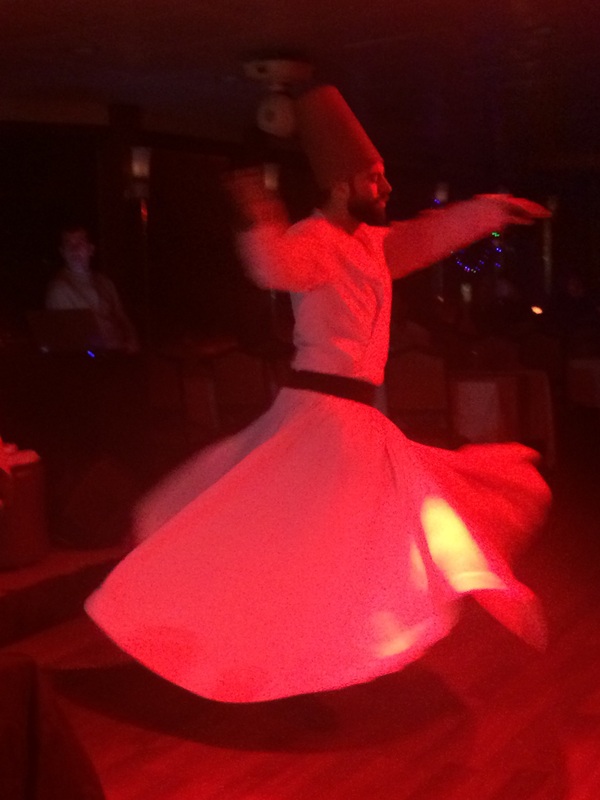 Three pairs of men and women took turns twisting, jumping, and turning to the Turkish folk music.. This is the experience I hoped for. 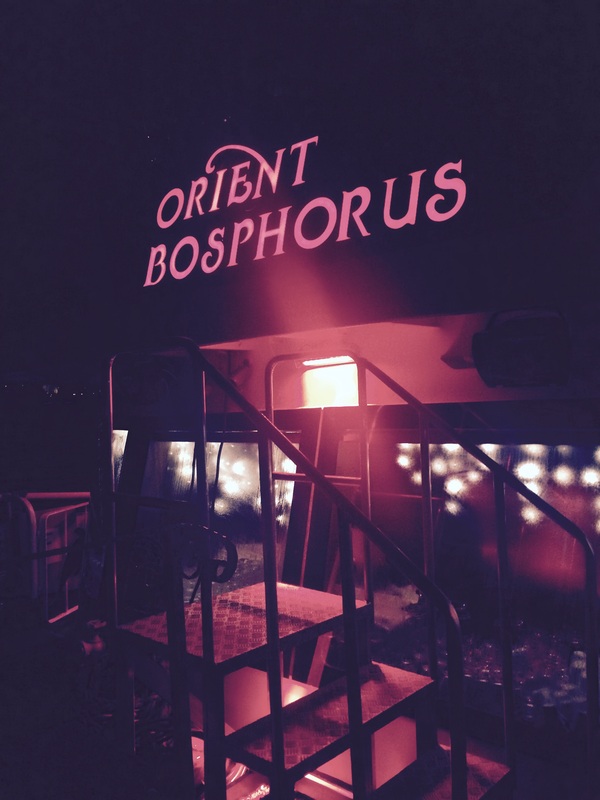 Although I am not sure how authentic this was, as this was a tourist cruise, I began to capture cultural bits of Turkey. The elderly host then introduced a Broadway-esque Turkish folk singer. He sang popular songs of the country, as the crowd clapped. The 40 something man then chose to follow similar pattern of the elder Turkish host. He went around the room, spotting the various country flags, and proceeded to sing a song from many of these homelands. When he got to my table, “Start spreading the news…” were the words that rolled out of his mouth. I haphazardly clapped my hands, pretending to be amused. I wanted attention of me and America, until I disembarked the ship. “Please don’t pick me. Please don’t pick me,” was the mantra I repeated internally. I am sure I even wrote this into my journal. “And Miss America, will you please come up?” No! My attempt to appear distracted failed. Generally I hate these types of forced participations in public settings. People are brought on stage to be made fools of. 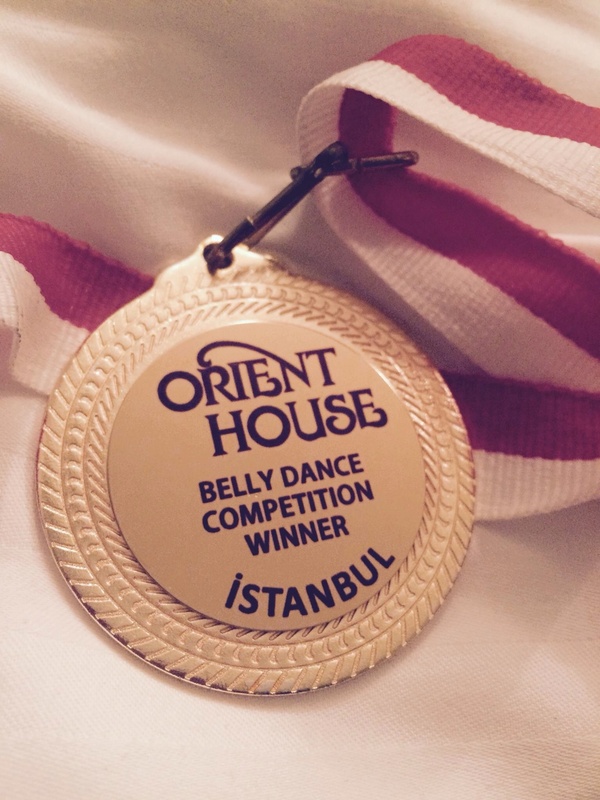 Earlier in the evening, two Turkish men were dragged on stage to dance with the main belly dancers. The families laughed and clapped, it was comedic entertainment for the ship, and embarrassment for the participants. But this time I decided, I had nothing to lose. I knew nobody on this ship, and would probably never see them again. I had actually taken some bellydancing classes in the past, although it had been years since I had practiced any of them. This would be over shortly, and so I entered the competition. The singer, showed two basic steps, that we each had to momentarily practice as a group in front of the crowd. After the practice began, our dance solo was expected. It was not a 30 second dance solo, as I was anticipating, but two full minutes! I clapped along, was the last to perform, and hoped the music would be quick when my turn came. Each person had their family members cheer for them as they swayed their hips, I was worried if the applause would be silence when my turn arrived. I could dance with minimal movement, as the others appeared to be doing, or give it my all. When my turn came, I turned out the embarrassment and perceived hatred, and turned up the percussion of the song. My body remembered the shoulder shimmeys, the figure 8s, and snake arms. I allowed my body to sway and flow, not caring how this was perceived. But a surprising thing happened, the crowd began to applaud. The older Turkish host came back on stage, and although not one winner was specified, he stated “The American was the winner for that hands down. You are welcome to come work on this ship.” His earlier comment of me being “The Boss: CNN” now shifted to an authentic backup bellydancer. I’ll take it. The dinner cruise began to dock, and a 70ish disco Turkish song played in the background. The host was encouraging everyone to come to the dance floor for a final dance. I was back in my seat, pleased for how the night turned out, but still not wanting to dance alone. Then a Turkish 20 something girl pulled me up to dance with her and her family, her Turkish mother and little 7 year old sister. As we danced, I tried to speak to them, but I realized they didn’t speak English. We were communicating through dance, and they approved of me. 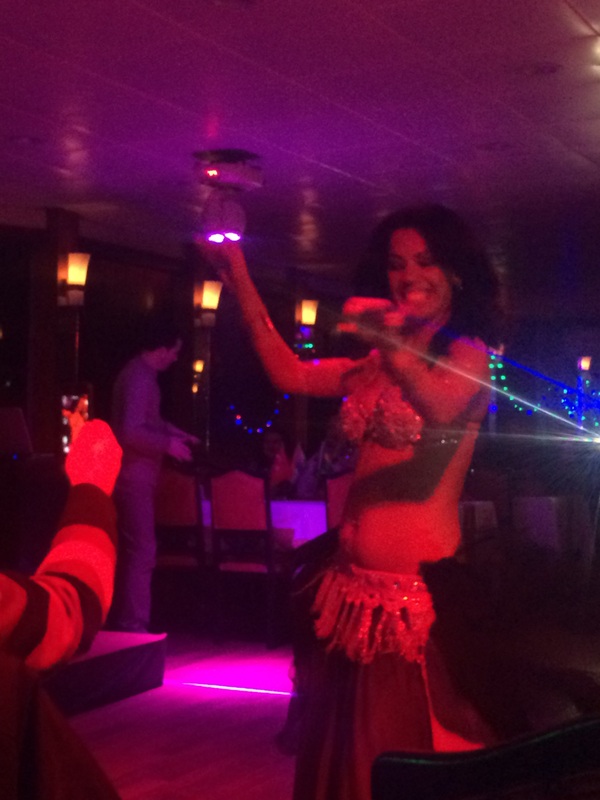 Further into the song, two teenage girls from Dubai pulled me aside and asked “Where did you learn to dance like that?” and “Can you teach us?” I continued to display some of my bellydancing moves with them. As I reflect back onto this night, I can’t help but smile. It’s not because I won the bellydancing competition, but I momentarily won the hearts of these people. Numerous countries represented who initially appeared to despise Americans, welcomed me as I was able to display my respect and knowledge of their authentic traditional dance. There is such power available to each of us in these small moments when we travel. Although it seems we can’t do much to change the world, but it’s possible through a small act of dance you can begin to break barriers between nations…and momentarily share a smile. I watched this amazing documentary this weekend, if these kids can find commonality in dance, think of the possibilities.